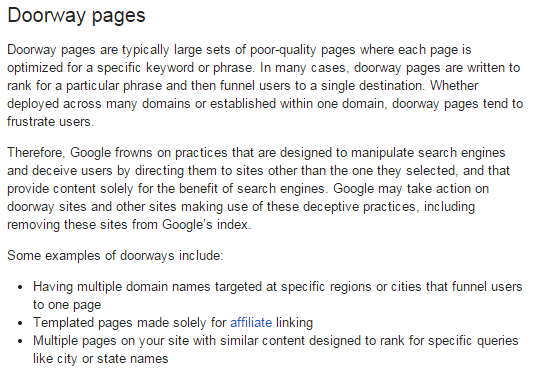 Google has updated the old definition of doorway pages and added some clarifying examples in order to combat doorway page spam. Doorway pages are a set of webpages (same or different domains) that is created specifically for the search engines and redirects the users to the same destination. This can be frustrating for the end users because even after clicking on different search results, the user is taken to the same landing page URL. So, please don't waste your time and money creating doorway pages cause they might land your entire web properties into trouble. Anything that goes against the quality guidelines is dealt severely with Google.